Months ago, an email with an appealing subject reached every Sewanee students’ inbox: “New Year’s Eve in Havana? 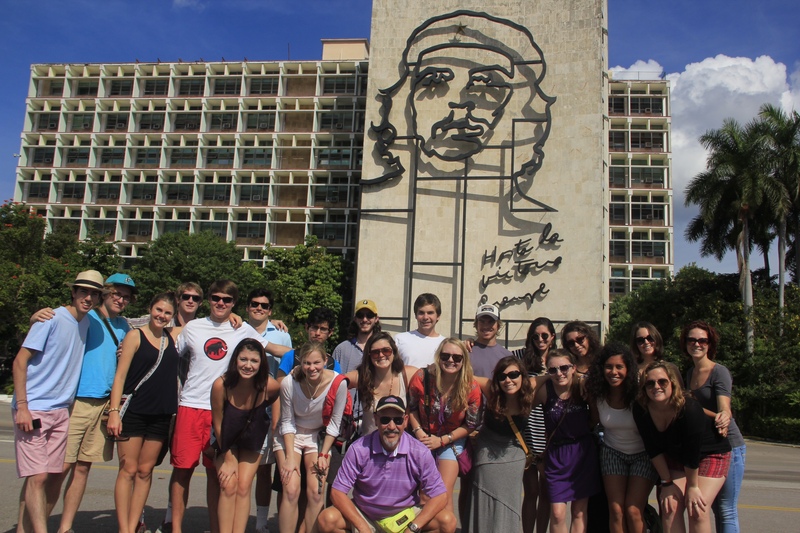 The Study trip to Cuba.” That slogan, along with the charm of the well-known Sewanee Spanish professor Thomas Spaccarelli, was enough to attract a group of students to this annual Winter Break program. The first of these study trips to Cuba took place in 2011. After the Obama administration gave approval to study in Cuba, Professor Spaccarelli and his former student Grant Burrier (C’05) started conversations about the trip there and about how interesting it would be “to go to Cuba to see for ourselves the island nation that has been so heavily punished by US sanctions and blockade.” At the beginning it wasn’t easy to convince the University that traveling there was legal, “but eventually everyone read and comprehended the law that allows for study trips like ours,” Spaccarelli affirms. The group departed December 28 and arrived in Havana, where they stayed the majority of the trip. They spent New Year’s Eve in the Old Town, surrounded by live music and streets packed with thousands of Cubans ready to celebrate the arrival of 2014. In the words of Abbey Rowlands (C’14), “spending New Year’s Eve in Cuba was awesome! They have a tradition over there where they throw buckets of water out of their windows at midnight, and we ran down the street where they were doing it, dodging the splashes as we went.” Afterwards, they toured other parts of the island: “I was convinced that to have a really comprehensive vision of Cuba we had to travel outside of Havana,” says Spaccarelli about the planning of the program. During all three of the trips, they have visited other areas such as the Bay of Pigs, Trinidad (a Unesco World Heritage city and epicenter of sugar production and the slave economy of colonial Cuba) or Santa Clara (where the Che Guevara mausoleum is). Besides that, Viñales, the tobacco growing area of Cuba, is another classic destination. Paul Campbell (C’14) also highlighted: “The biggest thing that we got out of the trip wasn’t going to museums and stuff. It was experiencing a culture that feels incredibly foreign, but at the same time is so close geographically to the U.S.” Sarah Parker Haynes (C’14) admired how satisfied people are with only a very few belongings. Will Noggle (C’14), was also impressed at “how content people seem about the government and about what the government is doing for them.” However, amongst the things that some of the participants on the program disliked most, they considered one of the biggest problems of the country to be the confusing double-currency system. Chris Haberstroh (C’16) loved the aforementioned tobacco rolling farm; Richard Huber (C’ 16) said that he loved the Cuban beaches, its crystalline sea, and also enjoyed seeing the old cars on the streets; or Hannah Fay’s (C’15) favorite moment was riding the “cocotaxis” (motor-powered rickshaws) during New Year’s Eve. If you feel that you also need to experience a Cuba trip like this, don’t worry; sooner or later that appealing email will appear in your inbox again.